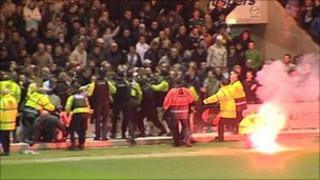 Police from the football intelligence unit are continuing to review CCTV and broadcast footage of a Devon football derby marred by violence. The Plymouth Argyle versus Exeter City match on 9 November was the first time the clubs had played each other for eight years. Twenty-two people had been arrested so far and one man has been given a four year football banning order. The teams will meet again on Saturday, but more police will be on duty. Last month there were 60 Devon and Cornwall officers at Plymouth's Home Park ground, but this has been increased to 200. The force was criticised for not anticipating the trouble that happened in and outside the stadium. There had been some disturbances during the Johnstone's Paint Trophy clash, which Exeter won 2-1, but more trouble broke out at the end of the game. A police spokesperson said reviewing the footage was a time-consuming process, but more arrests were anticipated. The public would be asked to help identify any suspects the football intelligence unit was unable to positively identify, the spokesperson added.